Pool Cleaning in Ipswich, QLD 4304. Aclean House Washing provide excellent cleaning service for pool cleaning, poolside cleaning services in Ipswich. We provide high-quality cleaning services at best price. A pool area should always be kept clean and well-maintained at all times. This is because if it is not, then it can give rise to a spate of infections and affect anyone and everyone using the pool. That is why the pool area and the poolside should be in pristine, clean condition at all times. So any soap residue, grime, oil, or grease in the surroundings can make the area slippery which in turn can cause accidents. And not just this, all of these residues should never ever seep into the pool water. For any exterior surface cleaning, depending upon the type of surface, be it brick, concrete or even stone, our pressure cleaners will ensure that the best pressure cleaning service is undertaken. The outdoor cleaning shouldn’t just be undertaken to clean the outdoor area of your house in Booval, but it should really make an eye-catching difference. As it will pollute the water and can cause illnesses and also cause skin infections too at times. So, if frequent poolside cleaning that employs high pressure cleaning is relied upon, then that is a good way to ensure safety in all ways. 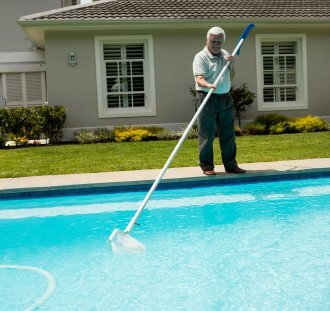 Poolside cleaning again is a specialised cleaning service that not too many cleaning services offer. And poolside cleaning in Ipswich is something A Clean House Washing offers. Poolside cleaning is unlike other cleaning services. So, that is why we at A Clean House Washing employ poolside cleaners who know how to carefully go about the poolside cleaning. A lot of care is taken to ensure that no dirt or water from the poolside area will ever trickle or drip into the pool. Again, it is very important that if your poolside and the surroundings are clean and well-maintained, then the pool water will also be relatively in a good condition. For anytime poolside cleaning in Ipswich, just get in touch with A Clean House Washing on 0419 778 863. Or email us on acleanhousewashing@gmail.com.